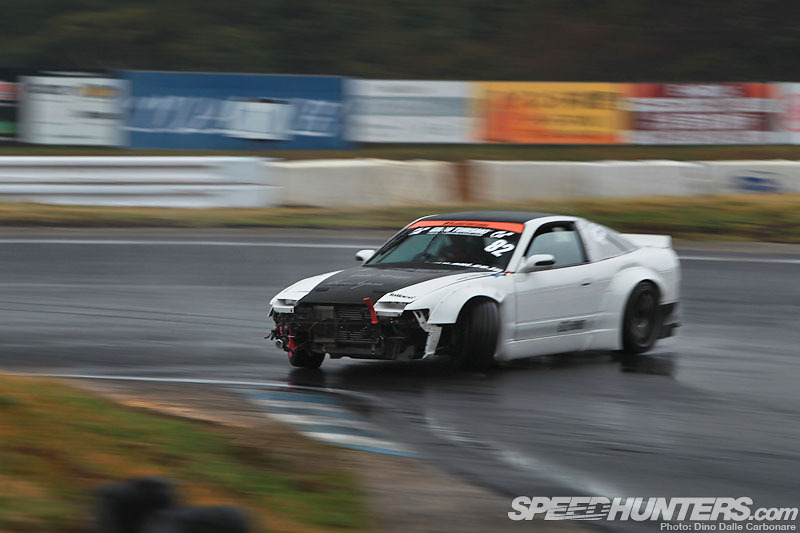 Change and variety are the single most important things that keep drift series going. D1, after enduring some tough times a few seasons back and what can only be described as a bit of stale period, seems to have regained its momentum again. And while the organizers continue to mix things up by selecting exciting new venues, it’s the teams and drivers that we should all be taking our hats off to. 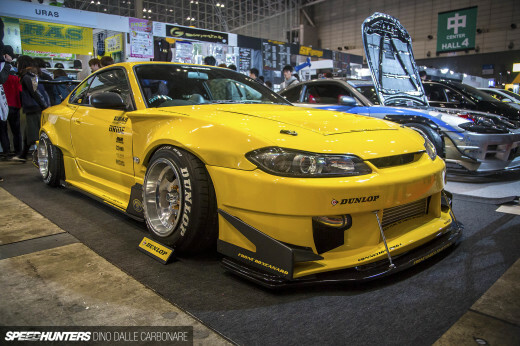 These guys are what make D1 what it is, pushing forward and continuing to come up with new cars, new and more powerful tunes and even more aggressive driving techniques. And that’s precisely why I found myself at Mobara circuit last week, invited by Ueta-san of BenSopra to attend a pre-season practice session. But wait a second. What does BenSopra have to do with D1? …unloading what at a first glance seemed like two identical cars. 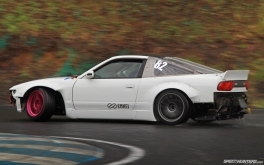 Upon closer inspection the first RPS13 that was pulled off the truck was the famous VR38-powered 380SX, the car that literally stole this year’s Tokyo Auto Salon show. But before you get too excited, this has actually nothing to do with their D1 entry. 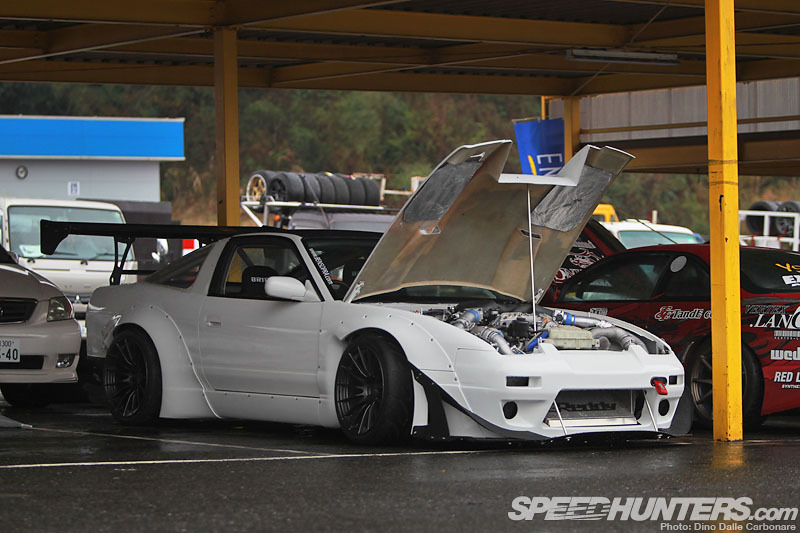 Since we featured it back in January this unique 180SX has been stripped of its graphics and repainted in glossy white, covering the flat coat it had before. The idea is still to attempt a high speed run in Nardó, but it was deemed a little premature to attend this year’s event which was held last month. So as Ueta-san of BenSopra explained, they have just under a year to make sure they get the car ready and set-up. 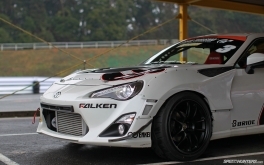 First step now is the exterior, which will be getting all-new graphics ready to be put on display at the Nagoya Exciting Car Showdown this coming weekend. 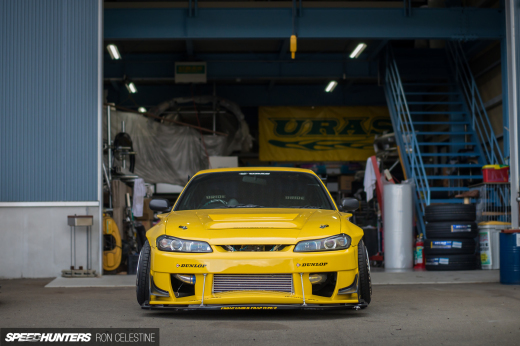 …instead it was their new 6666 Customs kitted 180SX that would be put through a shakedown test. As you can see from the windscreen banner it has already been officially entered in the D1 series. …Jin Horino. 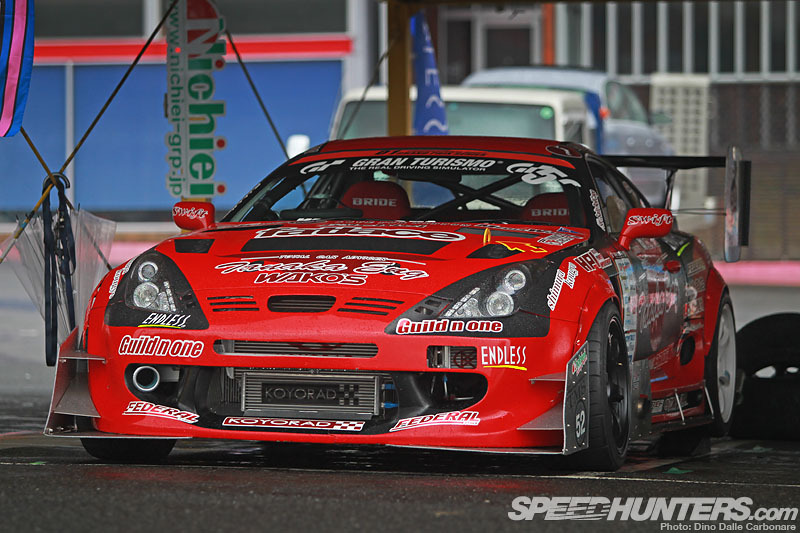 Jin is a seasoned drifter having competed in D1 as well as Street Legal in the past. 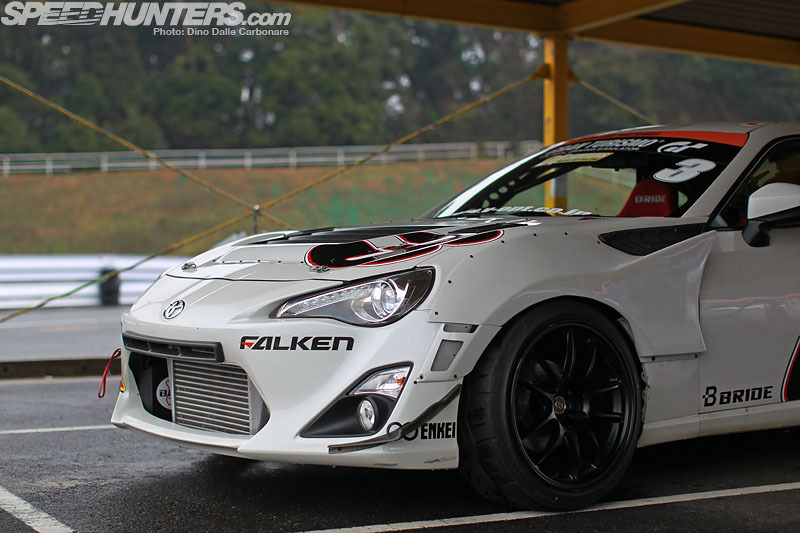 It will be up to him to get the “Team BenSopra/Rocket Bunny with Tops” to be competitive from the get go. They had a bunch of spare rear wheel and tire combinations; these that were used at the beginning of the day were Gram Lights 57Xtreme from Rays. Under the hood you can see just how much work has gone into guaranteeing that the RPS13 is ready for battle later on this month. 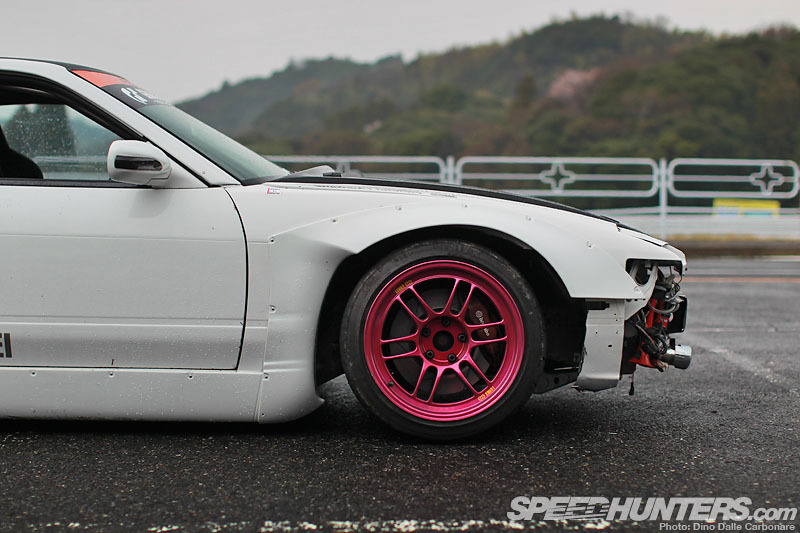 The car sports a fully spot welded and reinforced chassis, painted in metallic bronze – the same color used on the SR20’s head covers. 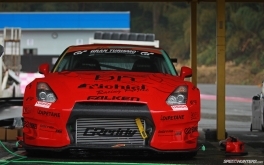 The motor has been extensively modified with a 2.2L bottom end and a Trust T67 turbo, all good for well over 500hp. With the rear hatch lifted you can get a good look at the roll cage. 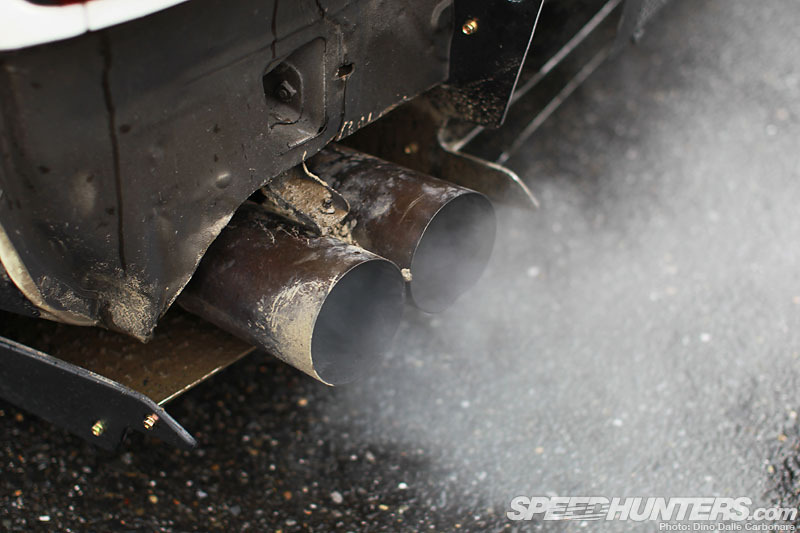 …and the tailpipes of the mean-sounding twin exhaust system. Seeing the wet and slippery conditions it was deemed safer if the car ran without the front bumper. 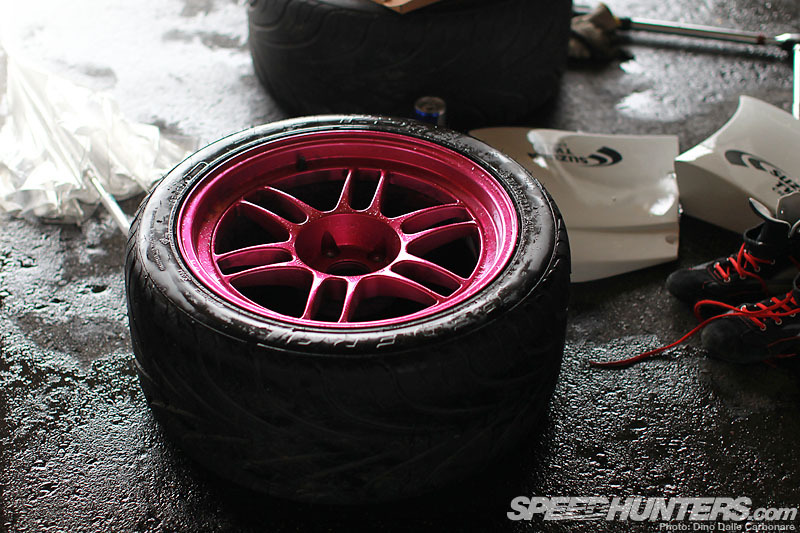 The 6666 Customs kit is so new there aren’t that many replacements available quite yet! …smoothly balancing it on full lock through most of Mobara’s tight corners. He kept pushing harder and fine-tuning the suspension settings as well as the alignment to find what best suited the conditions. …ripping off half of the rear driver’s side fender. 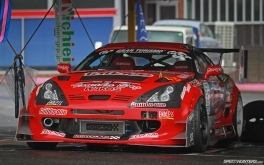 Team Nichiei was also at the event with Yuji Tanaka – the driver of the Guild N One JZA80 Supra with Celica headlight conversion. …feathering the throttle and in the process releasing the occasional backfire through the side exit exhaust set up. …but it was the other red car in the pits next to it that grabbed my attention. 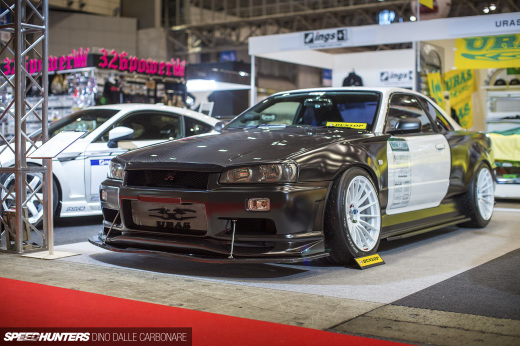 This is the RWD BenSopra GT-R, sporting an all new wrap ready for its D1 debut at the Round 1 Exhibition in Osaka on the Sunday following the main event. Due to some clutch issues the R35 wasn’t driven, but that didn’t stop it from looking ridiculously aggressive just sitting there! As my short walk continued I also spotted another D1 personality, everyone’s favorite joker of the series – Nomuken. 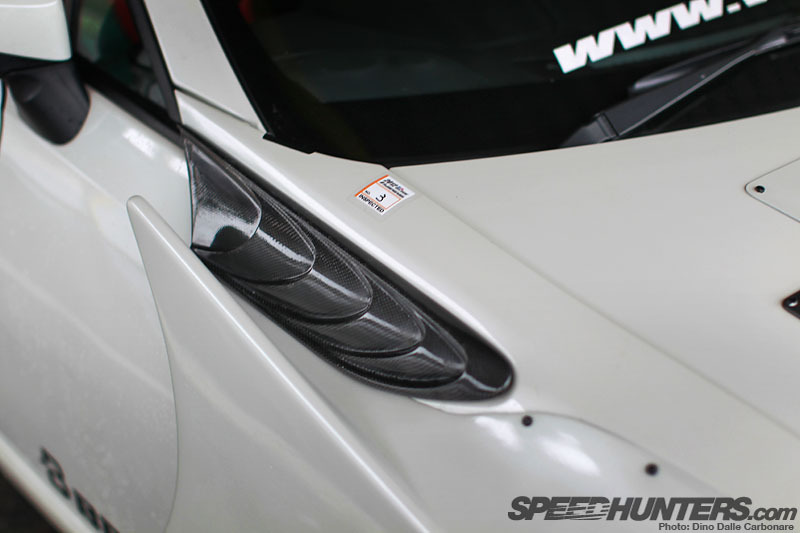 …spiced up with the odd carbon detailing. …revealing the beautifully executed conversion. Not bad eh? …as well as the mother of all wings! I will definitely be covering the odd D1 round this year but for that you will have to wait until later in the season; I will be up in Nikko during the Osaka event doing something completely different. More on that soon!